You are looking for a more suitable environment conducive to work on your projects and get the job done, our flexible and secure co-working space is the perfect temporary or short-term solution. Our hot desks require no commitment with daily rate. Just book as you need! $30 per day ($20 per day for member)! You’ll always have a place to work downtown. Co-working desks are the perfect solution for those that want to break out of a home office but want to save money on office space and work in a lively, productive atmosphere. Walk-ins Welcome! Members Only $20 per day! Find out more about our membership. Every 10 Hot Desk bookings, Get one Free All day Hot Desk pass or one hour Free meeting room. Every 10 hour meeting room bookings, Get one Free All day Hot Desk pass or one hour Free meeting room. 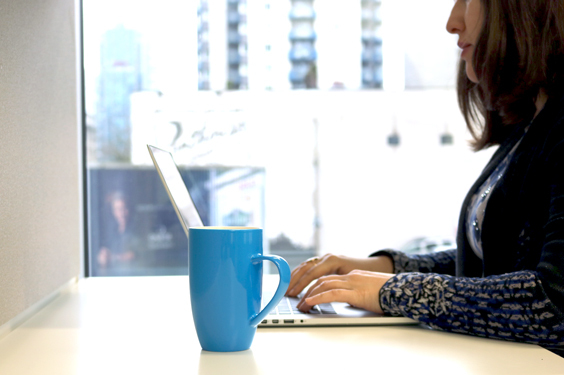 The local coffee shop just isn’t good enough anymore, our flexible & secure co-working space is the perfect solution. 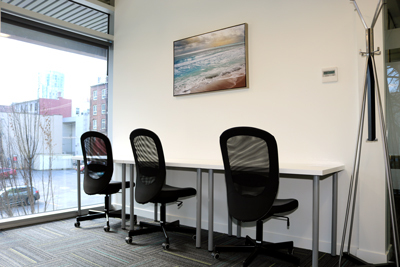 Call or email us to book your hot desk or just walk in and start working on your projects! 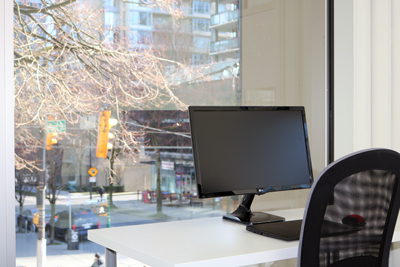 Check out our complete workstations, equipped with 24″ monitor, PC/Mac connectors, keyboard and mouse. So you don’t have to worry about carrying them with you. Just come and work on your projects. For only $35 per day! Members Only $30 per day! Find out more about our membership. You don't need to carry your monitor, keyboard or mouse, your workstation is ready! Just come and start working on your project. Book your Smart Hot Desk today. Looking for an Office Airbnb? 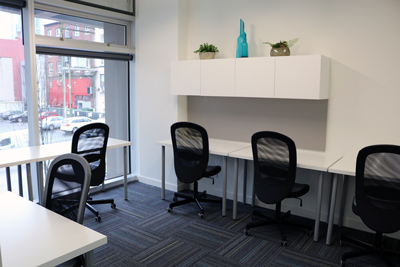 You need a great office space where you don’t have to worry about access to power outlets or a fast and reliable Internet? Then VanCubers hot desks are right for you! 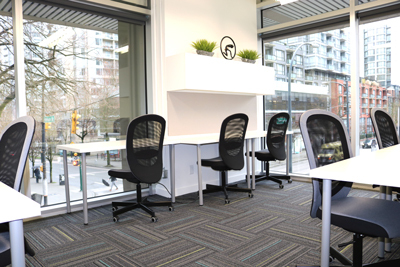 All of the amenities and infrastructure that you expect from an office is available via our flexible shared office space. You’ve got high speed internet, as well as access to printing, scanning and faxing services. 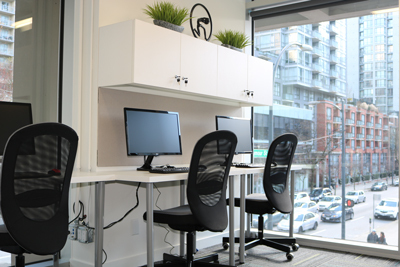 Our shared desks, AKA hot desks are always available for rental. 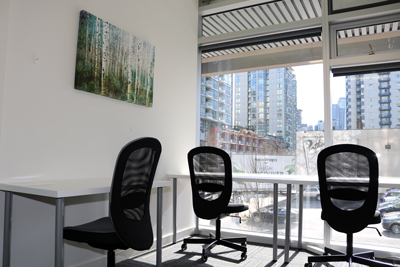 Our drop-in hot desk workspace is located steps from the Canada Line station. 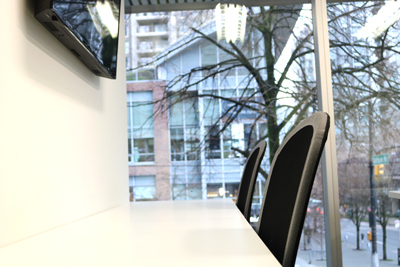 Our office is ideally located for any business; Central to Gastown, Yaletown and the business district with dozens of quality restaurants within walking distance.